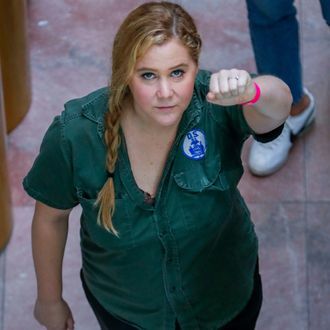 Amy Schumer and More Celebrities Arrested at Kavanaugh Protest in Washington, D.C.
Thousands have assembled today to protest Supreme Court nominee Brett Kavanaugh by marching on the Senate Office Building where his confirmation vote will take place. Among the masses a few celebrities have been spotted speaking out against the judge, with Amy Schumer and Emily Ratajkowski ending up detained by law enforcement. Prior to Schumer being processed by law enforcement she posted a video to Twitter giving a shout-out to one of her fellow protester’s children, saying that she was probably about to get arrested. As per her prediction, Schumer was detained and it was captured by MSNBC. Ratajkowski also posted about her arrest on Instagram.